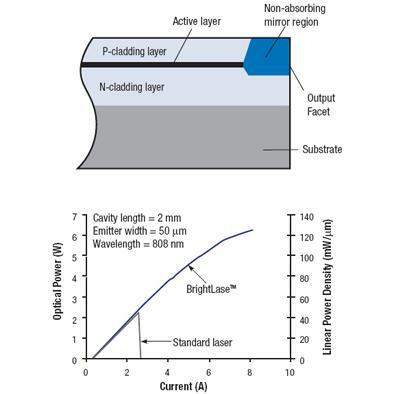 QPC Lasers, a world leader in the design and manufacture of high brightness, high power semiconductor lasers, has demonstrated >6.25W from a 50µm wide 808nm single emitter, in excess of 125mW per micron of emitting length. Manufactured with QPC Lasers proprietary BrightLase® semiconductor laser technology, the single emitter power levels are well above the facet power densities previously reported in the 808nm regime. “Our customer’s applications are increasingly requiring the highest brightness single emitters for their solid state laser pumping, materials processing, medical and printing products. The demonstration of world record brightness levels from 808nm high power single emitters will enable QPC Lasers to commercialize a new line of high brightness high power semiconductor lasers.” Jeffrey Ungar, Chief Technology Officer , commented.